Offshore sportsbooks favor the Miami Hurricanes to beat the Wisconsin Badgers by four points. This will be a rematch of the 2017 Orange Bowl. On that occasion, the Badgers conquered the Canes 34-24. According to the best online sportsbooks, Miami were 6.5-point underdogs. Meaning they not only lost straight-up but also failed to cover the spread. The Hurricanes finished this season third in the ACC’s Coastal division with a 7-5 record (4-4 in conference play). Their ATS record was slightly worse, going 5-7 during the regular season. However, they finished with a 24-3 blowout of Pittsburgh as five-point home faves. 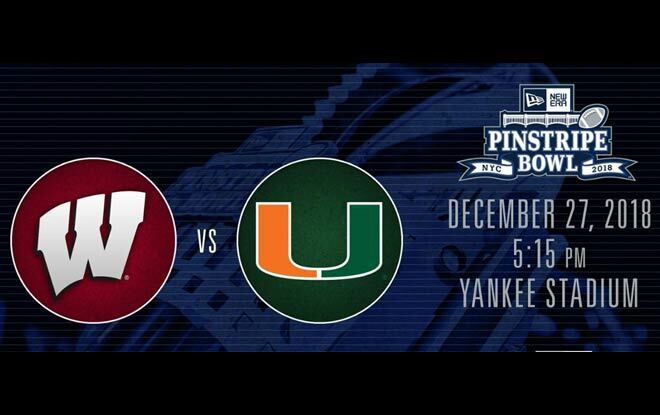 This will Miami’s sixth straight bowl appearance and first Pinstripe Bowl. The Badgers came in second in the Big Ten’s West Division, recording eight wins and five losses (5-4 in conference play). The Badgers posted an even poorer 3-9 ATS record. They closed their season with a 15-37 home loss to Minnesota as 11.5-point chalk. This will be Wisconsin’s 17th consecutive bowl appearance and first Pinstripe Bowl. The Badgers have won their last four straight bowl games. The last three of which have been under head coach Paul ‘H.’ Chryst. N’Kosi Perry has 13 TDs and five picks on 1089 passing yards. He has completed 51.6% of his attempts. Meanwhile, Malik Rosier has thrown six TDs and another five interceptions. Jeff Thomas and Lawrence Cager have nine TDs on 915 receiving yards between the two. Travis Homer has four TDs and 969 yards on the ground. According to Offshore sportsbooks, the Canes have covered just three of their last eight as faves of at least three points. Alex Hornibrook has 13 TDs and 11 picks on 1532 yards through the air. He completes 59.5% of his passes. Jack ‘Ice Cream’ Coan has four TDs and two picks. AJ Taylor and Jake Ferguson have a total of seven TDs on 949 receiving yards. Jonathan Taylor has 15 TDs on 1989 rushing yards. The Badgers have covered seven of their last 11 games as dogs of at least three points. Time: 5:15 p.m. ET vs.
Our Game Prediction: The Canes will be looking for some payback. However, South Floridians can’t be expected to do too well in the frozen wasteland of New York. That may be the only advantage for the Badgers. That and the fact that Chryst is their head coach. All things considered, though, neither teams can be trusted against the spread this season. Miami only covered in four games, two of them on the road. And Wisconsin covered only three, also two of which were away from home. This one could easily go either way. Users of Offshore sportsbooks might be more comfortable betting on the under. The Canes started out as a point-making machine but their production decreased in their last few games. And the Badgers have been held to 22 points or fewer five times this season.